Install PEAR with WAMP server on windows 7 or windows 8 seems easy. First we have to install WAMP server. Make sure wamp is running fine. Give your path and press enter. You can look like following screen. Now, You can run go-pear.phar file using following code. Next, that will ask you “Are you installing a system-wide PEAR or a local copy?”. Give your answer like “local” and press Enter. It’ll ask confirmation. Just give “yes” and press Enter. You can see 12 files with default location and it’ll ask location change? If you wanna change, just give “all” and change that. Better, Set default one. For default location, press Enter. “Would you like to alter php.ini ? [Y/n] :”. Give “Y” and press Enter. Add Path Variable into your System. 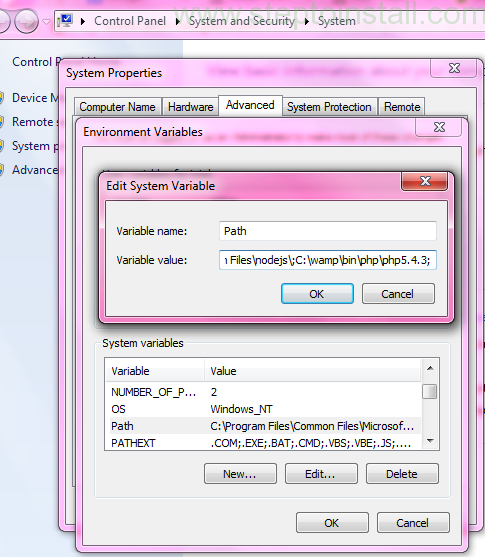 Here, you’ll get Environment Variables Window. Here, select PATH into ‘System Variables’ and click edit. Now you’ll get Edit system Variable Window. Here, Add you PEAR folder path with Semicolon. Don’t for forget, only add the path, not replace. click ‘OK’ and Save it. Close opened command prompt and open New CMD. Give “pear” command and press Enter. If PEAR running successfully, You’ll get PEAR’s list of commands. So you Installed PEAR. Superb article. Very helpful.Thanks buddy! I am running a wamp server on my Windows 64 bit 7 Home Premium SP1 pc. When I type php go-pear.php I get Could not open input file: go-pear.php error What am I doing wrong? Duh! Once I typed php go-pear.phar it worked. Thank you for this step by step instruction! Thanks for the detailed tutorial. I am running into one problem, I am not able to install any package. e.g I want to install “Net_UserAgent_Detect” package. I try it with adding pear at the end , remove the last “\”. but it always give the same error. can you please suggest any solution? Great article – very straightforward, thanks. Very helpful article. Thanks a bunch! soy principiante el tutorial esta muy bien, mi problema fue no tener claro que version de php tenia para los comandos en cmd (php5.5.12) 😉 gracias.